THE death has taken place of one of the most familiar face in the world of horseracing. 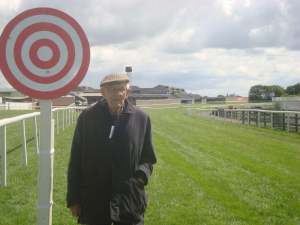 Bill Martin from Ballitore who passed away last week was among Ireland’s older and regular racegoers. In his 98th year he was also an enthusiastic member of the Michael O’Callaghan and Irish National Stud racing clubs. Bill first fell in love with racing in the late 1920s, well before his 10th birthday. The sport dominated his life and he went racing several times a week if possible, visiting almost every racecourse in the country. Most recently he was in Naas and Gowran and had been looking forward to attending Leopardstown last weekend. But it was not to be as Bill took ill on Monday last 28 January and passed away in Naas Hospital on Wednesday 30 January. He was honoured at Galway Races for attending the meeting for 80 years and on that occasion was congratulated on his achievement by President Higgins. In 2017 Bill was back in the parade ring in Galway as part-owner of the Michael O’Callaghan-trained Perfect Soldier. His interview on At The Races both before and after the horse won, which demonstrated his love or and his enthusiasm for the sport, was viewed as one of the best possible advertisements for racing and racehorse owenership. “Dad was healthy all his life until last Monday morning. He was admitted to hospital and his condition took a turn for the worse. It was very sudden and we are all very shaken by it, especially our mother, Brigid. “We would just like to thank everyone in racing who was so kind to him over the years. He lived for horse racing and the people involved in it. A farmer by profession Bill was a proud native of Ballitore and lived all his life there with his wife Brigid where they reared their family. His and Brigid’s story features in ther book Vanishing Ireland by Turtle Bunbury. His funeral took place on Thursday morning from the Church of Saints Mary and Laurence, Crookstown to the adjoining cemetery. He is survived by his wife Brigid , sons Eddie, Declan and Bill, daughters-in-law, sister-in-law, grandchildren Jessica, Zoe, Niamh, Chloe and Ben, nieces, nephews, relatives and friends.